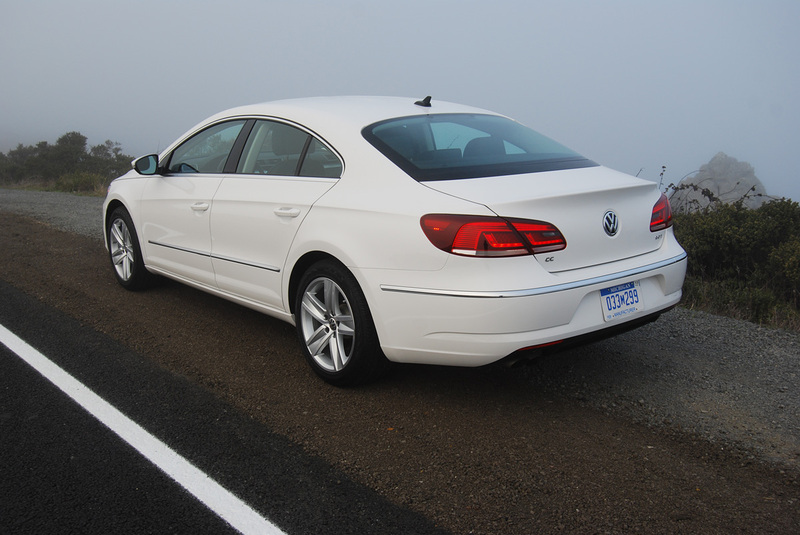 Seven years ago, when VW introduced the CC, I tested one for a week in Boston. My week with the car expired early when I left it parked overnight – apparently with the lights on – and came back to find the battery dead. Now a dead battery would not normally present more of a problem than the need for a jump start, but once restarted, the CC failed to recharge its battery, died again, and had to be towed away. My mistake was to park the car without switching the headlight control off. This is a 3-position switch with Off, On and Auto offered as choices. Most cars take care of this common oversight by automatically cutting power to the headlight circuit after a specified time interval, a feature not shared by that early production CC. So I performed a little test on this latest CC to se if VW had rectified the problem. I left the headlights on, shut the door and returned 20 minutes later to find the high beams still blazing away. 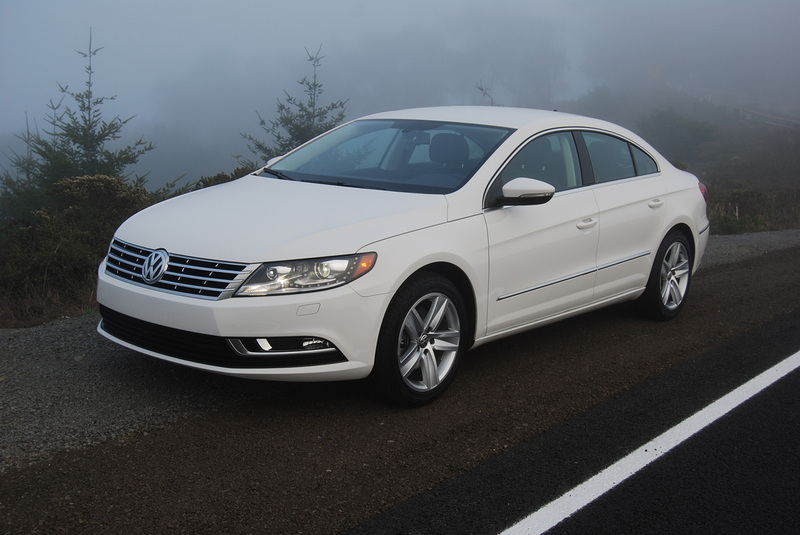 Ironically enough, for 2013, VW equips the CC with a Lighting Package that includes rows of LED bulbs that line the headlight nacelles and help drain the battery faster than ever before when that switch is left on. Seven years, no change in circuitry. Buyer beware. Other than this switch glitch, the CC is a very good deal at $31,430. At that price, you’ll get the 4 cylinder version, with direct injection and turbocharging good for 200hp and 207 lb.-ft. of torque. If you desire more oomph, a 280hp V6 is available, but not strictly necessary in terms of performance. Certainly, the turbo 4 is strong enough to light the front tires when you pop the clutch on the 6-speed manual gearbox. The manual transmission, which is unavailable on the V6, turns the CC into something of a sports sedan, with closely spaced ratios and short throws resulting in lots of driving pleasure. Unfortunately, the clutch on our 7,000 mile test vehicle had apparently seen enough abuse in its past to cause its engagement point to vary widely, from just off the floorboard to the top of pedal travel. This in turn lead to uncertainty when making hill starts and stoplight getaways. Even with this drawback, the 6-speed CC was infinitely more entertaining to drive than that rather staid paddle shift automatic V6 in Boston. The Lighting Package includes an “Adaptive Front Lighting System” which is perfect for improving night vision on twisting roads as the headlight beams swivel from side to side in tune with the movements of the steering wheel. From an ergonomic standpoint, the interior of the CC is close to perfect. The handsomely tailored front seats cradle you like a hammock. The equally comfortable rear seats allow passengers to slouch instead of sitting bolt upright. 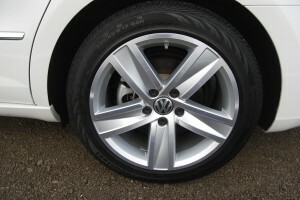 In addition, the rears split at 60/40 and fold flat, enabling transport of bulky items. The fit and finish of the CC, which is built in Emden, Germany, is second to none. The dash, door panels and center stack are pleasantly understated in matte aluminum trim. Stitching is precise, joints meet with Euclidian perfection, and the CC generally looks like it costs twice as much as it does. Although the moniker “SPORT” is part of this CC’s name, you’d want to do some suspension and tire work before tackling any really demanding backroads. The CC is very softly sprung, and tends to heel dramatically in corners when pressed hard. The shock absorbers are valved to favor ride comfort over jounce control, and the all-season Continental ContiProContact tires (235/45R17) are high on wear but low on grip. Though the CC may look the part of a sizzling sports sedan, the underpinnings need some work if you want to keep those BMWs in sight. Looks are what will sell this car. Without question, the CC remains a fresh styling exercise that is scads more vibrant, sleek and svelte than any other VW on the road.